d3 Technologies introduced the latest release of the company’s software–r13. r13 has a mix of new features including a new UI look and new HMSF timeline which enhances the d3 workflow. Other features include improved matrix control, time code readout module and an upgraded web module. r13 Software Leading r13’s new features is the new timeline. d3’s timeline is now frame accurate, working in hours, minutes, seconds and frames. 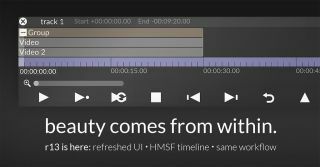 Users can zoom into a single-frame view to make precise adjustments as naturally as show-wide edits.The new timeline is fully compatible with existing d3 projects. Additionally, the UI has been given a lick of paint. Windows are translucent with a blurred background to let you see the content beneath while maintaining legibility. The text has been updated to a cleaner, modern typeface and sharpened for retina displays. Rounded corners create a softer feel, unnecessary detail has been removed, and UI colors are more subdued to reduce visual distraction. There are also two new Timecode Transport types: System Time, and Timecode Tester. System Time makes use of the Windows clock and allows users to sequence a show to the time of day, perfect for daily running installs. The Timecode Tester is like a built-in timecode generator and is great for testing project cueing behavior before getting to the full-size equipment onsite. The Timecode Readout module allows users to place a timecode clock in their stage view for the purposes of reference or even to use in the show itself. The module is able to display the timecode going in and out of d3, as well as time before next section and time elapsed/remaining for a video clip. There is also now a spherical mapping type to aid with projecting onto spherical or hemispherical objects. This behaves in a similar fashion to the cyclical mapping type and uses equirectangular projection to map video content. Additionally, d3 now supports output to Puffersphere’s spherical screens. Snapping guides and rulers make a return in r13, making it easier for those setting up pixel-perfect outputs in the new feed editor introduced in r12.1. r13 went through extensive in-house testing, and was released to a group of beta testers for a two-week period to be put through its paces before being released to the public. “Thanks to the d3 beta group for providing such detailed feedback. As a result further improvements to UI contrasts, color parameters, general legibility and bug fixes we made prior to the official release this week,” says Lars Paape, product development manager who recently joined d3 Technologies.